Finding the right form of entertainment for your child can be time-consuming. Children love jumping around, using up all their energy. The trampoline is ideal as it not only ensures that your child gets the exercise they need, but it is great fun for them too. Whether indoors on a cold or rainy day or out in the garden in the summer, the trampoline gives your child entertained for hours. Choosing the best trampoline for toddlers and kids is very important. As with any child’s play product, safety first. Knowing that your child is having fun and gaining the exercise that they need is reassuring for any parent. 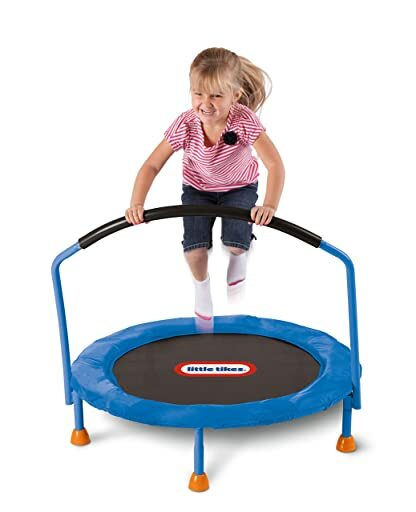 The trampoline is also a great way for your child to practice motor skills and stability. A trampoline is a springboard that can be used as a jumping and landing area. It is a piece of elasticated fabric kept taut with springs connected to a metal frame and used for recreation and entertainment. Basically, it is a piece of keep fit and sports equipment. 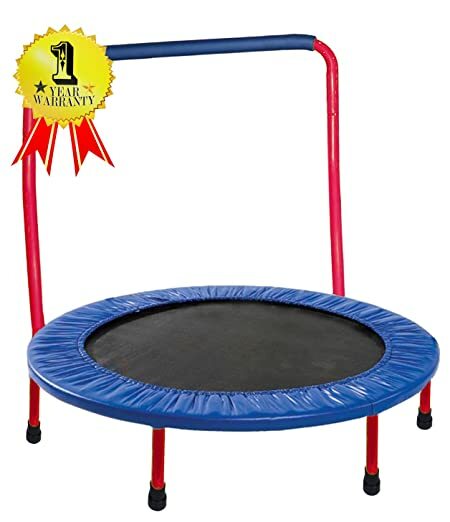 The best trampoline for toddlers and kids has a metal or hard plastic frame adapted for small children with an added balance bar. It can also be seen as an elasticated rubber or bungee material attached to the frame via springs or ties and a safety enclosure if used outdoors. Personally, I believe the children’s trampoline was invented from the old past time of mattress bouncing. It is a great past time; there may be a few knocks and bruises but none the less brilliant. The actual inventor was George Nissen and the idea was derived from the diving board in the nineteen thirties. It was meant for not only entertainment but sport. George Nissen himself, an avid athletic designed a structure that would enable him to somersaults in the air. It became very popular and is used in gyms and schools all over the world. It was then adapted for the modern day. When looking for the best trampoline for toddlers and kids, there are few factors that you will need to consider, one of them being size. Do you want specifically for outdoor, indoor or both? How old is your child? A lot of people go for the bigger options but with it goes a lot more supervision. As an addition to your child’s toy box, the trampoline has now been adapted for the toddler. They are small enough to fit in your front room and they are designed to fold away for easy storage, making it a tempting idea. As there are many different types and sizes of trampolines on the market, it is good practice to do some research. There are many different safety grades and features to any particular one. Children’s trampolines have to comply with regulatory safety standards. Please look out for this. Some of the cheaper versions do not. Authenticity is also something to look out for. Is it a genuine product and are safe materials being used. The last thing you want is for a child to have an accident or the trampoline to fall apart or break after a few uses. Let’s take a look at a few in more detail. This is an overall fantastic product for very small children. This product is interactive, fun and safe for your toddler. 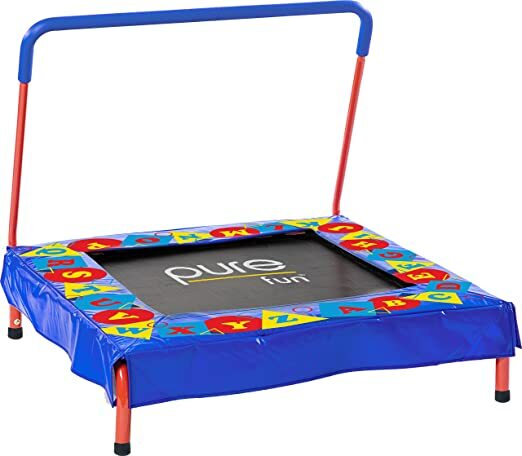 It is around jumping area, easy to use and safe and suitable for one child at a time. It is also colorful and fun, suitable for small bursts of energy and small enough to use in your front room or children bedroom. Consider it the first of many as your child grows. Ranked number one in customer surveys, this is the structure and the maximum age for a child who can use it is about three years. It is designed for one child at a time, unless really small. It is colourful and eye-catching and easy for a child to use. Look to it as a great start to the sport. The Gymenist portable is the next step from the infant range with its 36-inch size, from novice to semi-pro. This is a small square trampoline. It is bright and cheerful and offers to pad all around the jumping area for safety. There is also an option for padding on the handlebar for extra grip. It is educational with the alphabet design and reasonably priced. It offers noticeable fun for a child and is designed for more than one type of interaction making it interesting. A larger trampoline with a safety net included, this trampoline can cater for three at a time. It is made from expert materials enabling quality of fun and purpose is maintained to a high standard. This product is a great way to introduce your child to the joys of jumping. The Skywalker is a round trampoline with enclosure, ideal if you are looking for an all-round proactive trampoline. It is square to rectangular in style and comes with fully padded enclosure bars and strong enclosure net. It has a wide protected frame pad. Also, there are stretch bands instead of stretch springs that are strong and safe. Good quality materials have been used. An all rounder if you have the room. 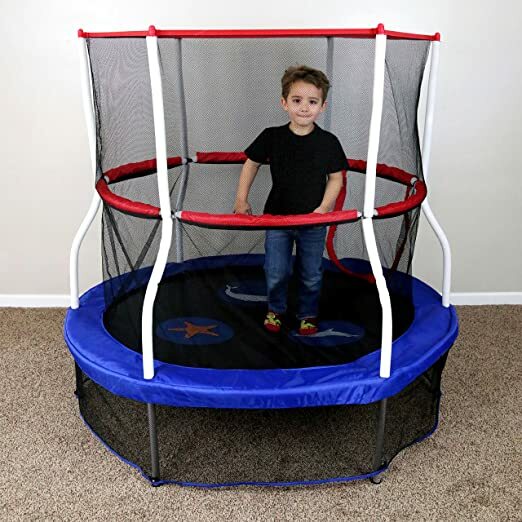 After researching five different children’s trampolines on the market and considering all the facts I find that the Skywalker 60 inch trampoline is the best trampoline for toddlers and kids. While the others score pretty well on various fronts, this one is especially large, easy to assemble, sturdy and can cater for more than one child at a time. Although it sticks to the manufacturer’s safety guidelines, the good make of materials means to me long lasting. The only drawback is maneuvering from inside to outside. 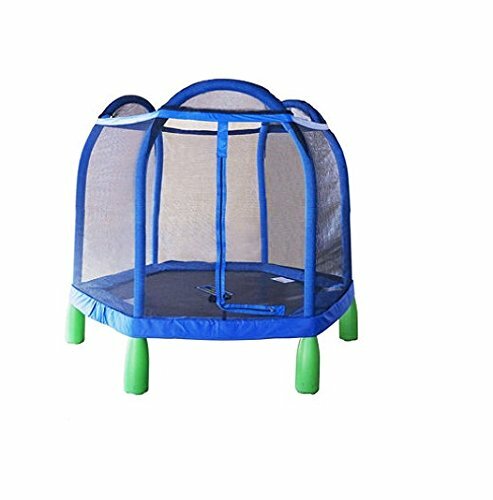 However, there is much peace of mind comes with the Skywalker trampoline as it is long-lasting fun and comes packed with all the safety features. For this reason, I would advise you take a closer look at product number five for the best trampoline for toddlers and kids on the market.